NEWS BRIEFS — Study shows that women are underdiagnosed for P.A.D. and chronic vein disease. PVCS: FINDING ANSWERS FOR PELVIC PAIN — Learn about PVCS and how to diagnose and treat it. 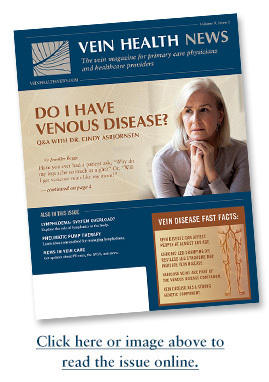 HOW PCPs CAN ADVANCE VEIN CARE — Physicians help patients understand vein health. FAVQ — Are “standing desks” at the office beneficial? ONE PATIENT’S PERSPECTIVE — A nurse with “bad veins” is on her feet and on coast-to-coast flights. What do veins have to do with pelvic pain? 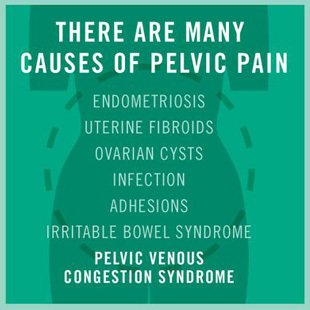 In women who have chronic pelvic pain, up to 30 percent suffer from pelvic venous congestion syndrome (PVCS). If you’ve never heard of PVCS, you’re not alone. It is often misdiagnosed or never diagnosed at all. 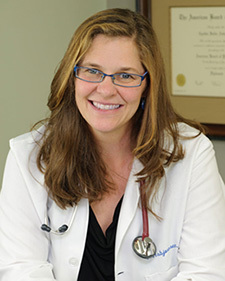 It can be challenging for a physician to determine the source of pelvic pain, especially once other, well-recognized gynecological issues have been ruled out. That’s why we talked to Dr. Joseph Gerding from Spectrum Medical Partners. With Board certifications in both Interventional Radiology and Phlebology, Dr. Gerding is an expert in diagnosing and treating PVCS. He helped us to explain what to look for and how to look for it, as well as options for treatment. In our second feature article, we continue the theme of raising awareness about another underdiagnosed condition: venous disease. A major part of my professional mission is to provide accurate information about vein health and treatment to physicians and medical professionals. I love talking to primary care providers, in particular, because they are seeing patients (and their legs) all the time. I am always available as a resource to doctors and allied health professionals. If you have questions about specific patients or general questions about venous disease, please don’t hesitate to contact me. Both pelvic pain and varicose veins can be a source of embarrassment or even shame. With this issue, we aim to raise awareness about both conditions so that patients, too, can be armed with information that will help them live full and healthy lives.